With more than 7,000 beautiful islands to choose from, planning a trip to the Philippines in 2019 can be a rather daunting and mind-boggling experience for any traveler. From the breathtaking, idyllic rolling hills of Batanes to the gorgeous cascades of Lake Sebu, the Philippines has an abundance of awe-inspiring destinations that are worthy of any traveler’s bucket list. Whether you’re a history buff or a beach bum, you’ll find your bliss as well ignite your innate sense of wanderlust in the Philippines. That said, to help you with your Philippine beach holidays plans this 2019, we’ve rounded up some of the best and most noteworthy places to visit in the Philippines. Even though setting foot on all of the 7,641 islands in a single year is an incredibly tall order, this list of places to visit will at least give you some inspiration and a good start to your adventure. If you want to take a break from the crowded cities and places to visit in the Philippines, then you should go for a luxurious getaway at Huma Island — a heavenly refuge full of indulgence and adventure. Nestled in the majestically stunning turquoise waters of Palawan, this one-of-a-kind Maldivian-inspired resort beckons to weary people who are longing for a tropical escape and a personalized Zen-like experience of exploration and discovery. 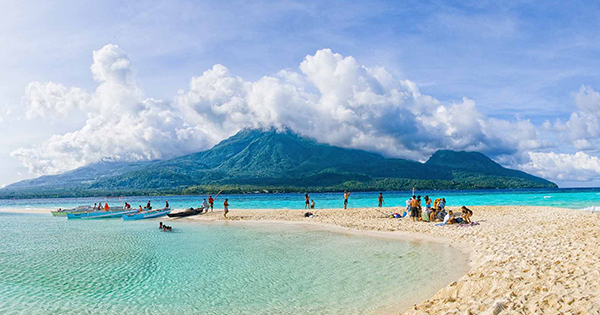 Known as the “Island Born of Fire”, Camiguin is a fascinating island-province brimming with volcanoes such as Mount Uhay, Mount Hibok-Hibok, Mount Vulcan and Mount Mambajao. As a matter of fact, Camiguin holds the world record for the island with the most volcanoes for every square kilometer. However, make no mistake — there’s more to this small Philippine province than its volcanic riches. After all, it’s a secluded destination that boasts a myriad of natural wonders, including refreshing waterfalls, cold and hot springs, and an untouched sand bar. If scuba diving is your thing, then make sure to book a trip to Tubbataha Reefs Natural Park. Billed as one of the world’s best diving sites, this wonderful aquatic world is a protected sanctuary that serves as a home to vibrant coral reefs, the endangered hawksbill sea turtles, sharks, lionfish, clownfish, sea turtles and manta rays. Inscribed by UNESCO as a World Heritage Site, Tubbataha is a sanctuary to dozens of bird species as well. The Manjuyod Sandbar isn’t dubbed as the “Maldives of the Philippines” for nothing. With its clear waters and a stretch of majestic white sands, this enthralling sandbar will definitely make you feel that you’re standing in one of the premier beach destinations in the world. Furthermore, it has cottages that seem like they’re floating on blue shallow waters, adding more flavor and Maldivian atmosphere to this sandbar. There you have it. These are just some of the best beach holidays Philippines destinations you can consider visiting this coming 2019. Of course, you should never charge into battle unprepared. Thus, plan carefully for your trips and don’t forget to bring a bottle of sunscreen with you.